Finished With Open Enrollment? Don't Forget About COBRA! Employee benefit plan changes are difficult, but the people changes can be treacherous. Employers are well-served to diligently track employees and COBRA participants before and after open enrollment so no one is lost in the open enrollment gap. 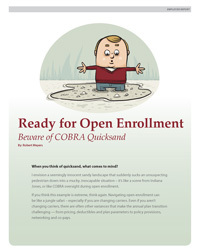 This helpful COBRA guide will ease the open enrollment transition and gives great COBRA info. to help you avoid costly COBRA mishaps. Get it now by completing the form to the right.